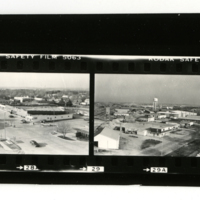 March 1987 -- View of Hesston KS looking northwest from top of Hesston Mill. In foreground is the cooper Electric Co and beauty salon in front. this was built and used by Royal Turkey Plant in approx 1948. In the center is Kropf Lumber Co. Complex. 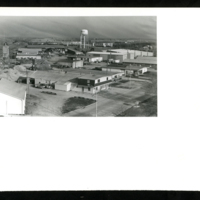 At right of watertower in background is corporate headquarters for Hesston Corporation (White Building) -- Written on Back of Photo. 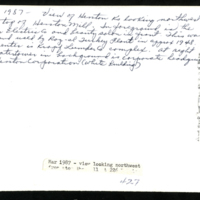 Hershberger, D., “View of City Businesses,” Hesston Public Library, accessed April 25, 2019, https://hesston.digitalsckls.info/item/1726.